Wayne Consolla of Viewtown, Virginia has developed an online map of the Long Island Motor Parkway. Wayne is inviting comments and feedback below or at his email viewtown@live.com. Great job Wayne! Anyway, I searched the internet for a GPS version of the LIMP and could not find anything so decided to start an effort to get a GPS version out there. 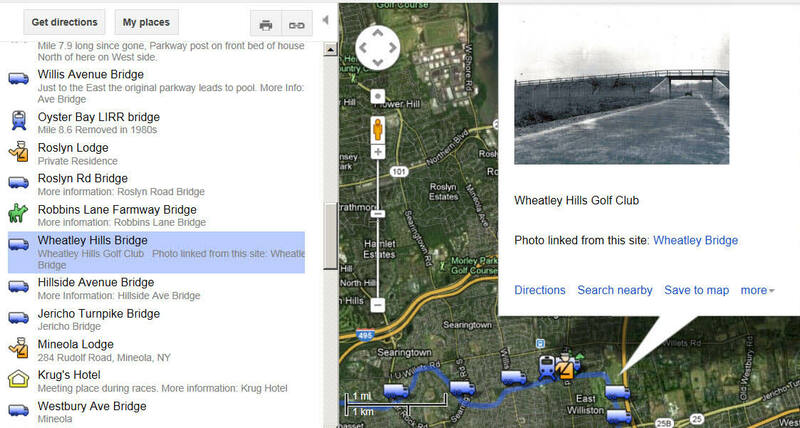 I spent the morning creating a Google Map which is available to anyone. This is only a start, as more "waypoints" are added it will become more accurate. I had a lot of trouble adding waypoints just west of Bethpage Park. Smart phones have GPS built in and now you can get an exact location by taking a photo or by actual tracking of your position. I have and Android phone and use Google Maps to track my position. This would be useful for the GPS map. The map should be fairly accurate at this point. I used GPS readings from 1947 topo maps and 1959 aerial photos from this historicaerials.com site. I am slowly adding points of interest. Please feel free to use this map in anyway you would like and I invite any comments to improve the accuracy. I can edit the map as needed. THANKS for all your hard work." 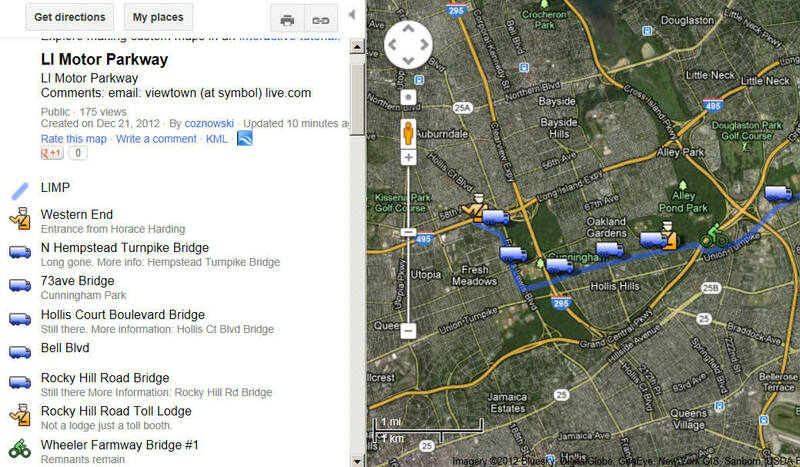 The Google Map provides a drop down menu of the key Motor Parkway locations. Photos are being added to several of the locations. Several locations have links to VanderbiltCupRaces.com posts. 99.9% of the work was done. All I did was connect the dots from Howard’s LIMP site. Please help with comments or corrections. Feel free to download the KML file from the google map and use it in google earth or convert it to a GPS file that will load into a hand held GPS. I use a Garmin eTrex and used a program GPSbable ( google it ) to convert it to .GPX. Note - the photos in the locations as noted above are not copied which may infringe on copyright laws. Instead they are a link to the photo on the web site they are stored on. None of the images were copied just used the “hot link” feature of google maps. Thanks Howard for a great site. This is a fantastic aid to really understanding how the VMP wound its way across the island! What I learned from it is this: I worked on Ruland Road in Melville and I would often wonder where the VMP ran through that area. What I learned is that it ran right through what was my office! Often I would stand outside the front of the building and try to see any signs in the woods across the street that might tip off where the old road had been. Turns out, I was ‘sitting on the road’ every day! Great job Wayne! Thank you! The map of the outline of where the motor parkway ran is great. I have to look at it more closely before I can comment on it,from what I see,I think I know of a few places it ran and may have to go check it out,if it’s the area where I live and too far,maybe I’ll find something. What a great tool Wayne’s map is. Andrew can use it ti go 1/2 mile north of Ruland Road on Maxxes Road and track along the LIMP from the bridge there. I need to figure how to download it to my Iphone 4. Is it an APP? Is it ON Google Map? I looked at the map a little bit more and found out it didn’t go thru anywhere close to where I live in Plainview, I have to look somemore,I might have found somewhere else I might know of,most of the places I saw you know of them already. YES you can load the LIMP map onto your Android phone and follow it’s path. Google maps are new on iPhone so don’t know how it will work on an iPhone. I have loaded maps on my Android phone and know it works. 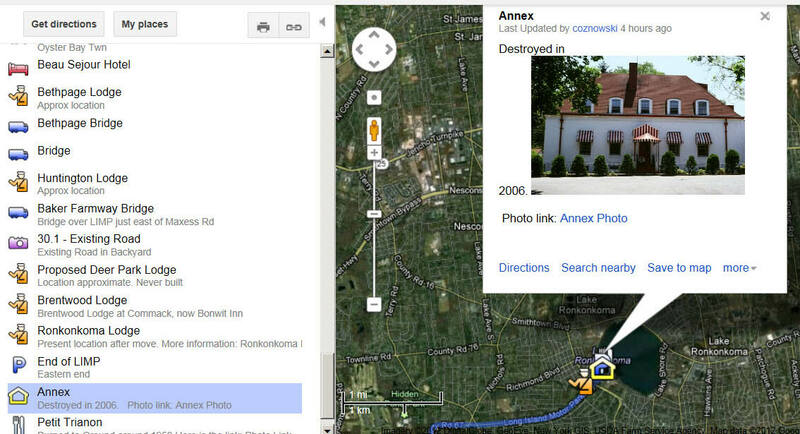 Import the KMZ (edit note: or KML) into Google’s My Maps. Click My Maps - Create New Map - Import. Name it and save it. Open the native Google Maps application on your Android. Click the Layers icon (the middle icon at the top right). Click More Layers at the bottom right. Click My Maps. Select your map. Voila. Your map, with your position (more or less accurate depending on whether you have GPS enabled at the moment). I looked at the map more closely,but didn’t find anything of interest that you people don’t know about already. I’m enjoying watching the short videos of the Black Beast in action at some events you were at a few years ago,what a famous car you have,Is it the most famous antique car on Long Island or what? I think so,you go everywhere you can with it and you are in a class of your own and the people are always amazed at it,I could go on and on about it,but we all know about it. My efforts on wikimapia to stitch the LIMP together certainly pale in comparison! Great job Wayne! A very helpful tool for LIMP enthusiasts. Perhaps you could add markers for the Old Country Rd bridge and the Clinton Rd bridge in Garden City. I also have a photo of the present embankment on the east side of Clinton Rd which can be emailed if you want to add it. Markers added for Old County and Clinton Rd Bridges. Included embankment photo in Clinton Rd marker. Keep those suggestions and corrections coming in. A side note: Using a 1947 topo map it does seem as someone suggested in another part of the blog that the house that I marked is the location of the Bethpage Lodge. It also seems to show up on a 1959 aerial photo. i really enjoy going through the history of the races and the road.